Adding pizzazz to your home’s front entrance is an easy, low-cost way to up your home’s curb appeal. Try painting your door a pretty hue that coordinates with your home’s color. “Just make sure there is a contrast between the front door and the facade of the home” says Melissa Goodman of Decorative Detail Designs in New Braunfels. 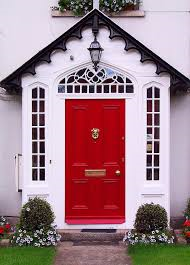 If your house is gray or white with black shutters, consider painting the front door red, she suggests. Other ways to beautify your home’s exterior …are adding appealing house numbers to your entrance and hanging a pretty wreath on the door. For extra pop, place a potted plant or two by the front entrance.